IAF personnel carried out two tests of the Akash Surface to Air missile at the Integrated Test Range (ITR) at Chandipur near Balasore in Odisha on Saturday, April 26, 2014 as part of user trial. A defense source told PTI, "The sophisticated Akash missile was test fired twice in quick succession from launch complex-3 of ITR at about 11.55 am and 12 noon." Both the missiles were launched against targets towed by a PTA flying over the sea. ITR Director M K V Prasad described the trials as being "fully successful." 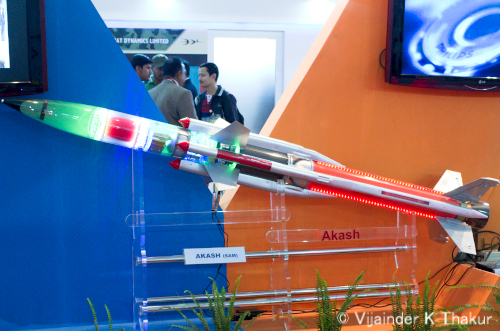 The IAF tested an Akash missile on Wednesday, April 23, 2014 from the ITR. The New Indian Express reported on April 24, 2014 that the missile missed its target - a pilot-less target aircraft (PTA). An official at the launch complex told the newspaper, "The missile was to destroy the PTA at an altitude of nearly 2 km as per the pre-designated coordination. But the mission failed as the weapon could not destroy the target. Though it attained the desired altitude, it failed to pass through missed-distance proximity." The proximity fuse can be variously set to explode with 10, 20 or 100 meters of the missile, according to the official.